Two sites connect via IPEC VPN across the internet. 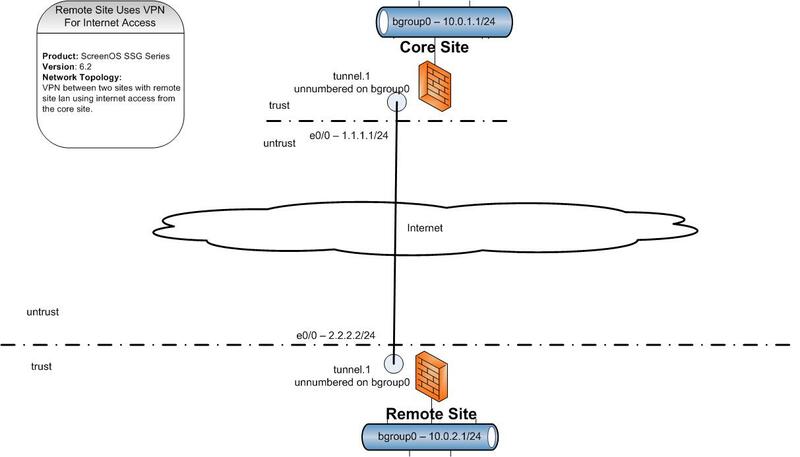 The internet requests from the remote site are forwarded down the VPN tunnel to the core site and uses the core site internet access connection. Each site has internet access to establish the VPN connection. But all browsing from client machines on the remote site are directed to the core site. 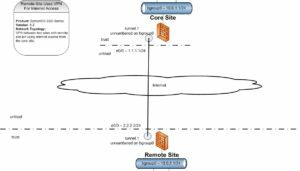 The process uses source based routing to force all requests from the remote LAN down the VPN to the core site gateway. On arrival at the core site the source address needs to be translated to a local core site LAN ip and then forwarded for internet access. The process utilizes IPSEC VPN in route mode, source based routing and address translation. Create a standard web access policy from trust to untrust using policy based source nat. Confirm internet access on remote site and observe translations in the policy log on the core site.